Defend your accessibility conformance claims with our Section 508 and WCAG 2.0 compliance certification services. Aurora Design and Consulting provides accessibility compliance certification for businesses, government agencies, and non-profit organizations. Our accessibility compliance certification solutions are recommended to verify and document compliance with Section 508 and the World Wide Web Consortium’s Web Content Accessibility Guidelines (WCAG 2.0). Compliance certification is a fully documented solution to evaluate and record the accessibility of a website and verify conformance with WCAG 2.0. 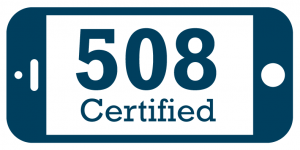 Our compliance certifications are the product of an accessibility conformance evaluation, and can be used to make accessibility conformance claims for Section 508 and WCAG compliance. Who might need an accessibility compliance certification? Government agencies preparing a response to a DOJ letter. Businesses responding to a demand letter, or court summons. Non-profits organizations seeking to achieve compliance with Section 508. Any organization, business or non-profit organization looking to reach a wider audience, and create a more inclusive online experience for their customers and constituents. The basis of any accessibility certification is a formal evaluation of website accessibility in accordance with the World Wide Web Consortium’s Website Accessibility Conformance Evaluation Methodology (WCAG-EM). WCAG-EM outlines the procedures for defining the scope of evaluation, exploring the website and choosing a representative page selection, evaluating pages for conformance with WCAG 2.0, and reporting evaluation findings. The evaluation report includes a summary of accessibility test results for the website page selection. The final evaluation report includes the results of automated and manual accessibility tests including: HTML/CSS validation, automated accessibility scans, contrast and font resize tests, and screen reader testing. Description of the page selection used for testing. Includes a description of the rationale used to determine an appropriate page selection for testing. Description of accessibility evaluation process, and summary of tools used in the assessment process. Summary of major accessibility barriers and repairs completed to address these barriers. Analysis of any remaining HTML/CSS validation errors, and their impact on accessibility. Summary of results from usability testing. Usability tests engage assistive technology users (including people with disabilities) to evaluate website accessibility and identify potential barriers. Accessibility conformance claim. Summary of accessibility evaluation results and final conformance level achieved (WCAG 2.0 priority level A, AA, or AAA). Websites are certified for accessibility conformance for a period of one year. Aurora recommends a conformance monitoring solution to periodically assess and document accessibility conformance as your site grows. Request a quote for Section 508 or WCAG 2.0 compliance certification, and take the first step toward achieving your accessibility conformance goals.